It’s that time again! Tuesday Stretch with the BugDoc. 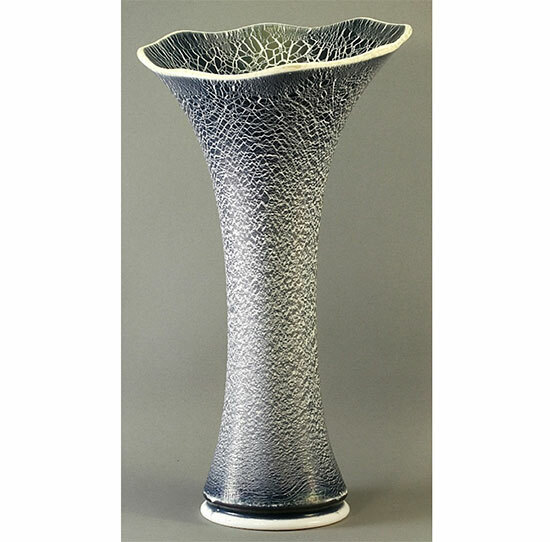 I get the question all the time, “What’s your favorite stretch glass piece?” My problem is that I have lots of favorites and it’s really difficult to come up with a single favorite. However, I can narrow this down to my favorite colors and iridescent effects. Renée and I, early in our collecting of stretch glass, settled on two favorite colors, both Northwood – Russet and Jade Blue. Over the years, we’ve amassed collections of almost all the pieces that Northwood made in these two colors. I’m including a Russet, square-footed, “Tree-of-Life,” square bowl, and a Jade Blue guest set as examples. We have over 80 different line items in each color! My other favorites tend to be pieces made out of iridized opaque glass. 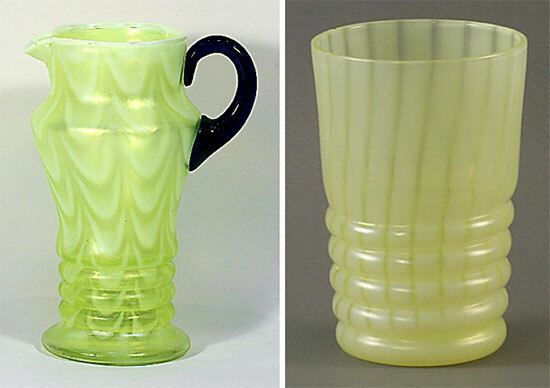 I covered these in one of my earliest Tuesday Stretch articles, but I notice that there was a recent discussion of iridized milk glass on one of the Facebook sites, and these pieces are another of my favorites. 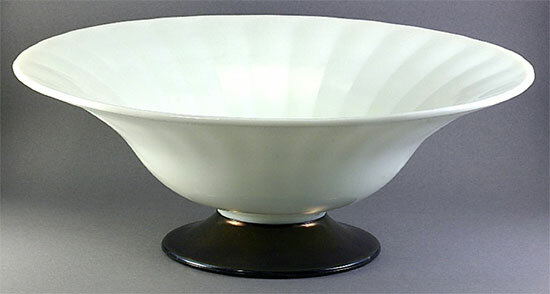 As far as my records go, I only know of four makers of iridized milk glass. 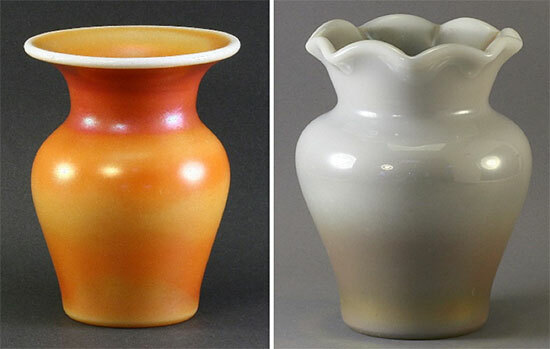 Remember that true milk glass is an opaque white and is not to be confused with the translucent opal glass. Peach opal and aqua opal carnival glass pieces are pretty common, but in stretch glass, we only have Fenton’s “curtain optic” and “rib optic” pieces (in Topaz) that were deliberately opalized pieces. Here are two examples of this effect. While I really like these opalescent pieces, the iridescence is always very subtle and verges on the satiny iridescence. Now take in these pieces with definite stretch effect! 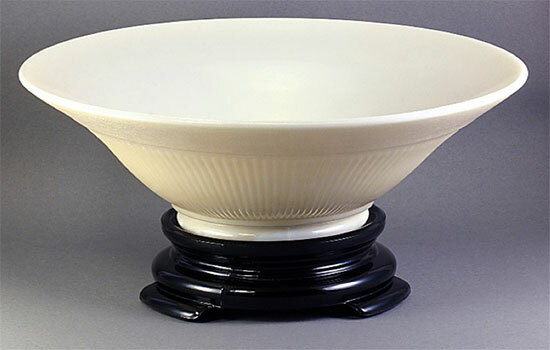 This bowl is an easy 11.5 inches across and both the milk glass and foot are iridized. The problem with these pieces is that the dope used was likely the tin oxide which leaves a very subtle translucent white iridescent coating. As you can likely tell from the image, the iridescence just doesn’t “pop” like the colored iridescent dopes used by Imperial on milk glass. 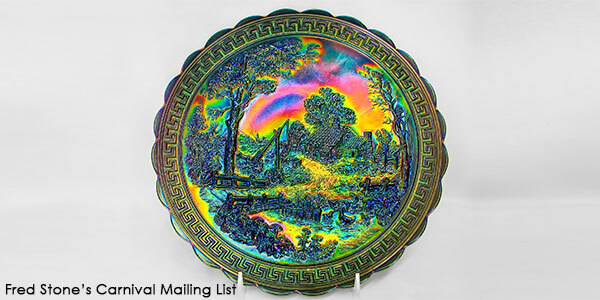 The third piece is a bowl with a unique, almost light-smoke iridescence. Again, like Northwood’s iridized milk glass, the iridescence is very subtle and has to be view in just the right light to be appreciated! My last piece is one of those “really rare, but who cares?” pieces. Basically, it’s really ugly and I figure it was Vineland’s attempt at doping milk glass. As you can see, the dope was unevenly applied and seems to have been applied when the glass had cooled too much. The result was dope that was easily rubbed off!